The colorful CA-1630 is more than just a drug-store tube tester, rather, it is a precision laboratory-grade equipment to accurately measure the transconductance of a wide variety of vacuum tubes. Its vintage is late 1950s or early 1960s. 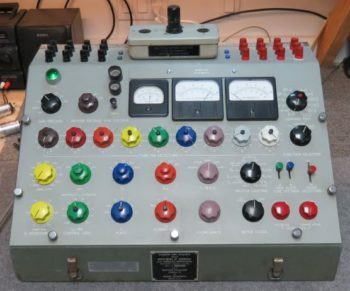 The tester was recapped and realigned October 2017, and prepared for use. The tester measures the transconductance of vacuum tubes. Transconductance is the characteristic of a tube that measures its ability to amplify a signal. i have one sitting in storage, serial number 100. This Members Projects page is the place to share your efforts with fellow collectors in words, photographs, and video clips. Tell them what worked and what failed. Share your tips and techniques. To post your project, please contact Director Thomas Bonomo. Tom can provide suggestions about the best way to submit your text and photos. Tom will format and post your project right here. Easy!